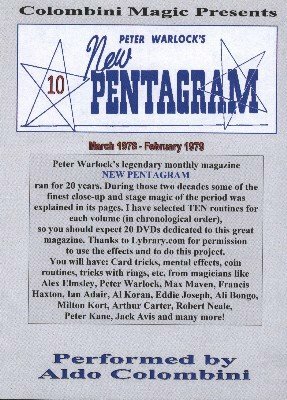 More magic from the pages of Peter Warlock's legendary magazine. CONTRASTING PREDICTION (Max Maven): A red-backed card is shown as a prediction. A blue-backed deck is spread face up and a card is selected. The prediction card is a perfect match. ALTERNATING CURRENT (Norman Houghton): Two sets of four cards each, one face up and one face down. You place them together and the cards magically alternate, face up, face down all the way through. RED VERSUS WHITE (Peter Warlock): This is a transposition effect using two balls, say one red and one white. Involves a cup and some sleight of hand. Neat effect. VINTAGE TRANSPOSITION (Nicholls Harley): Two freely selected cards change their positions. GIANT THIMBLE (Lewis Ganson): A very strong and entertaining routine using a miniature chop-cup (or any chop-cup as a matter of fact), in many phases. DIGITAL DIVINATION (Arthur Carter): A very strong prediction using a deck of cards where, after a deal, you predict how many cards the spectator holds. KINKS' MATE 3 (Arthur Carter): The four Kings are placed on the table and a spectator picks one. The deck is cut. If the selected King is the KH, the card cut at is the QH. UNTAMED (Bob Gill): An original version of the Wild Card routine you will love performing. ACE TRANSFEROO (Jack Avis): A production of the four Aces with a neat transposition of their colors. DOUBLE-OVERCUT (Max Maven): An impossible double location. From a shuffled deck two spectators select a card each (free choice) and yet, you reveal them.